As soon as the temperature begins to drop, the urge to buy new makeup overtakes me. The go-to product category I tend to spend most of my money on is lipstick. The hoarder inside of me just can’t say no to new lip products and going to Ulta, Sephora, MAC, Nordstrom, or anywhere else that stocks cosmetics, is usually a death sentence for my wallet. As much as I love buying higher end lipsticks, there are some amazing lip products out there that won’t make you cringe every time you think about how much money you spent on them. 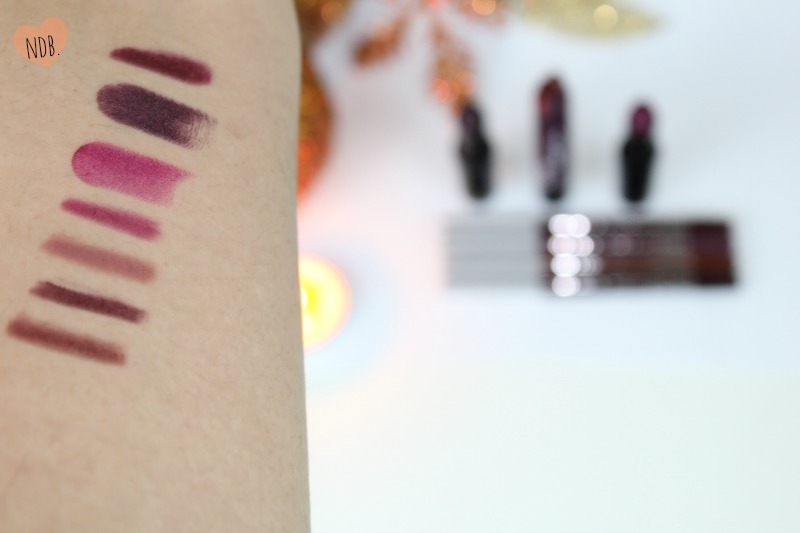 A fall 2014 drugstore lip product haul featuring Wet n Wild, NYX, and Jordana lip products. Bordeaux | A deep brown wine color is necessary when doing a bold dark lip, and I have heard great things about this color so I had to give it a shot for myself. I mean, it was only $2 so it’s not like I was breaking the bank. Currantly | This one is similar to Bordeaux, but it is darker and creamier. This one definitely glides on easier and the color is much more rich and warm toned. 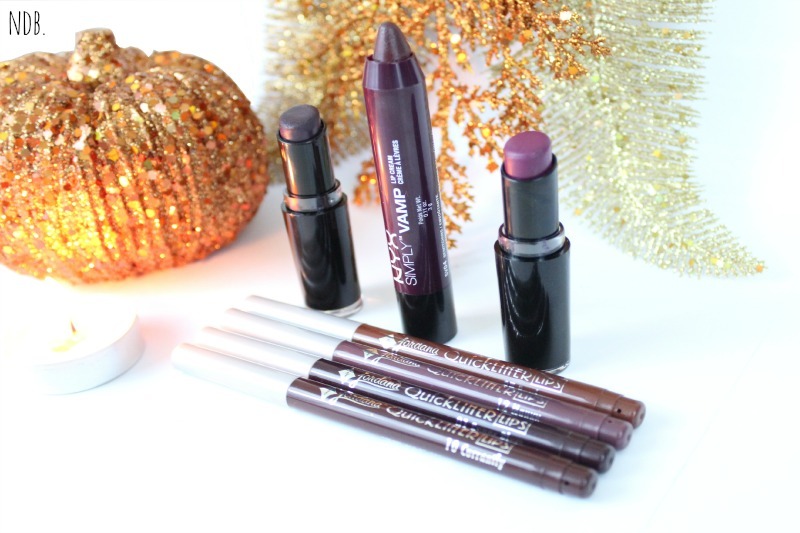 Mauvy | As much as I love a dark bold lip for Fall, sometimes you need to tone it down a bit. Mauvy is, you won’t believe this, a mauve color, so it has brown and pink undertones that are really pretty. This pencil glides on smoothly and I can tell I will be using this quite a bit. Sugar Plum | This is more plum toned, which really reminds me of the Fall season. If you pair this with a dark plummy red shade, it would look gorgeous! I may or may not have already worn this a few times, and I noticed that it leaves a gorgeous stain behind on the lips once it fades. The one womp | I do have to say that all of these lip liners do break easily since they are retractable. I find that pencil lip liners are more sturdy, but then again these lip liners are only $2 so it’s not too difficult to replace. Of course I needed to get some lipsticks to go with some of these lip liners. So, I turned to Wet n Wild and NYX. Both brands are well known for their pigmentation and great formula, which is something I especially look for when I want to wear a dark, bold lip. Sugar Plum Fairy | This shade is definitely a dupe for a well-loved and well-known lipstick, but I’m already going to be doing a separate post on that so I can’t give that away just yet! However, this lipstick is gorgeous, and it will look amazing on every skin tone! I’ve worn this once already and received a lot of compliments! Not only is it highly pigmented, this baby lasts a very long time since it is matte! And, once it fades it leaves a nice stain on your lips. I must admit that after a few hours it does start to peel a bit and feel uncomfortable on the lips, but if you look in the mirror it still looks flawless. Vamp it Up | This might be the darkest lipstick color I have ever owned, and I’m kind of in love with it. It looks almost black, but it is a really dark, vampy purple color. The finish is very creamy with a slight sheen, but nothing too wild and crazy since this grandma over here sticks to her matte lippies. Just like the other Wet n Wild lipstick mentioned, it leaves a stain on your lips and lasts for quite a while. Bewitching | NYX recently launched their newest lip products, which are the new lip cremes that come in a chubby stick form. After falling in love with the Revlon Matte Balm Crayons, I knew I had to give these a try so I went ahead and picked up a shade that would be perfect for the Fall: a dark, vampy, berry shade. I would definitely recommend this to everyone no matter your skin tone. It glides on easily and has a creamy matte finish– it definitely doesn’t dry out my lips, which I like. Mine was a little broken when I got it so that’s why it looks slightly deformed. *sad face* But, never judge a book by it’s cover, right? Hopefully my awesome photography skills (ha!) mask its deformity. What are your favorite drugstore lipsticks that are perfect for the Fall? Let me know in the comments! Also, don’t forget to check out the other posts I did for #lipstickweek: Too Faced Melted lipsticks review and a popular MAC lipstick dupe.